At Mohawk Honda we know that satisfied customers like you are our best ambassadors to reach new customers. 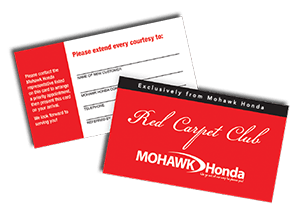 To thank you for sharing your positive experiences with others and recommending us to them, we’ve established the Mohawk Honda Red Carpet Club*. A $100 Reward for each new customer referred by you. Inclusion in our semi-annual $1,000 Grand Prize drawing for each $100 Reward you earn. Priority Appointments with the Mohawk Honda staff members that have worked with you. A 20% OFF Service Coupon redeemable on the first service appointment for their new vehicle. It’s easy to get started! Simply print the name of the new customer and your name (as ‘referred by’) on a referral card and pass it along to your friend. The entire staff at Mohawk Honda is excited to have earned your endorsement, and we’re committed to making it worth your effort. We’re proud to have you as part of our growing Mohawk Honda family!